Supreme Queen have epitomised the power and uniqueness of what is the "Queen" phenomenon. 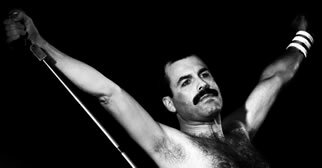 Their front man plays an uncannily realistic ‘Freddie’ with just the right look, stage persona and, most importantly of all, the most incredibly powerful voice! So if you are looking for a Queen Tribute show to remember, be it at an arts centre, Leisure centre, theatre, arena or festival, look no further. Their ethos is to recreate the Queen ‘live experience’ by making shows as authentic as possible using accurate costumes, instruments and by performing live concert versions of the songs. They have been performing since 1995 and the band has gone from strength to strength and is now regarded by many as the UK’s Number One Queen Tribute Band. They perform and top the bill at many prestigious venues including major theatres, concert halls and festivals throughout the UK, Europe and Asia. Highlights for the band include headlining the year 2000 International Queen Convention, playing to 10,000 people on the Beach at St Tropez for the famous HOG Rally, topping the bill at 2 sell out shows at the Mediterranean Conference Centre in Valletta, Malta and a quite stunning trip to Singapore. In Singapore, they played the Hard Rock Café which was basically a warm-up show put together for the press and then a second night saw them headlining at the incredible Suntec City Convention Centre.